Tip toe through our tulips! Our Floral department has an endless variety of flowers. From tropical bouquets from Hawaii to tulips from Holland we have it all. Some seasonal flowers even come from as far as Italy. 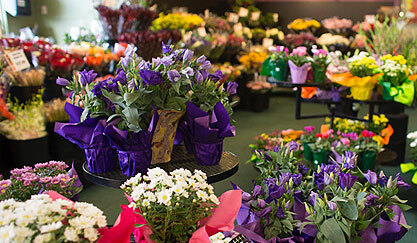 We are sure to have what you are looking for as our department carries a huge variety of fresh flowers daily. We can help plan a wedding, party or any special occasion with many years of experience we will help create a special moment that will be a pleasant lasting memory. Arrangements can be custom made for you, using your own special containers to make your event even more personal.